…Which means there’s no way this cover of an old computer enticed Western consumers to bite for a Master System. Set your Light Phasers to surprise! Zillion takes code-entering and laser-blasting to unforeseen peaks of excellence. 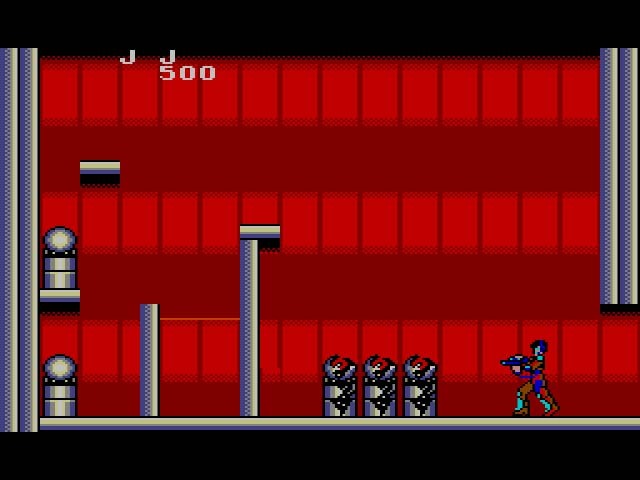 You start off Zillion as JJ, a secret agent who has to infiltrate an alien base, recover the Five Floppy Disks of Doom, blow up the base, and get out of there. Of course, there’s plenty of danger. Imminent death awaits you in each of the base’s rooms, which are filled with a mixture of guards, turrets, force fields. In each room is a computer terminal and a small amount of stationary pods which you can – nay, must – destroy with your laser. The pods contain either an ID card, bread for extra life, the occasional level up, and most importantly, a symbol that you can input on the computer. There are also four symbols that need to be uncovered from the pods and input into the computer in order for the pathway to the next room to be opened or unlocked. The symbols look random and impossible to decipher, but they’re easy to memorize once you know what they are. Every symbol is just the letters 1-9 mirrored next to each other, with the exception being 8 which looks like an infinity symbol and 0 which looks like… 0. It probably sounds confusing, but should you play the game and see the symbols, it will make a zillion times more sense. Smashing dumpsters ’til the breaka dawn. Zillion also gives you numerous codes at the beginning of the game that you can input at any time into any room, depending on what the circumstance calls for. Let’s say you enter a room with two electric barriers and four turrets, and there’s no way for you to destroy the pods necessary without getting overrun. Head to the terminal, enter in the proper codes (which are easy to remember as they’re always four of the same symbol for different actions), and the barriers and turrets will disable for a short window of time. If you do this, though, the computer will eat your ID card, so it’s important for you not to waste these. ID cards are fairly prevalent in the pods around the base, but don’t bother using them if you don’t have to. As you look for the Five Floppy Disks of Doom in each room (they’re always just found in pods, as if the alien’s couldn’t be bothered to hide them anywhere safer), you’ll encounter JJ’s kidnapped comrades, Apple and Champ. Once rescued, they become playable, with each character having their own defining features. JJ is the most balanced of the three. Since you’ll have played with him for most of the game, he will also be leveled up and strong by the time you reach Apple. Apple is limber and spunky and able to leap to the highest platforms without breaking a nail, but she’s also quite weak. Champ is a veritable beefcake, but his abundance of beef makes him slow. It’s nice to have the option to play as the other characters, particularly since they function as extra lives; if JJ dies and Apple or Champ are still alive, you’ll have the option to play as them. Still, JJ is the best, and I’d recommend you play with him through the majority of the game, using Apple and Champ only when necessary. Champ might be strong, but can he smash three dumpsters in a row? The crux of Zillion‘s gameplay – running to different rooms and inputting codes – doesn’t sound very exciting nor does the stock alien base environment inspire any emotion towards the task at hand. 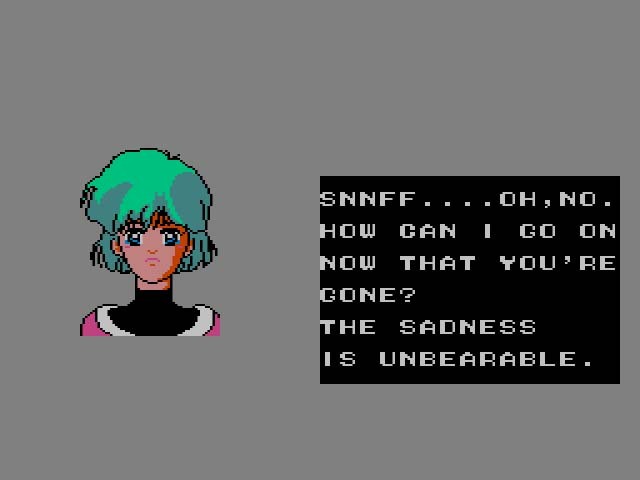 Nevertheless, I was hooked the entire time I played Zillion. Once I arrived in a room, I always wanted to make it to the next room to see what awaited me. Going from room to room is cake in the game’s first section. Guards can be avoided by crouching, then shooting. Bread and ID cards are plentiful. There’s very little danger to be found. But once you arrive to the rooms with the red backgrounds – and if you’ve played Zillion, you know what I’m talking about – each room bears the potential to be JJ, Apple, and Champ’s final resting place. Guards move at different speeds while crouching and firing; multiple turrets (usually no less than four) will be set in both vertical and horizontal positions and shoot at different times; the red force fields will blend in to the red background, almost ensuring that you miss one and unleash more guards into the room. These were the rooms that I was excited about entering. I’m not ashamed to say that I died numerous times in these areas. 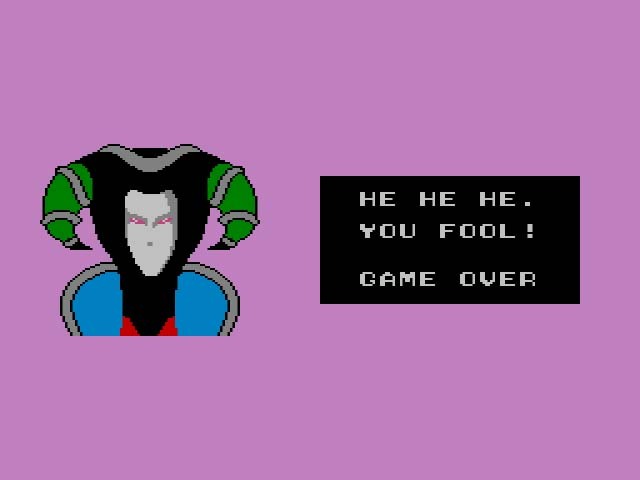 Sega’s “one more room” hook kept bringing me back, though, despite my many deaths. Player beware: there are no passwords for this game. If you plan to beat it, get ready for the long haul. Don’t worry, baby. We’ll always have continues. 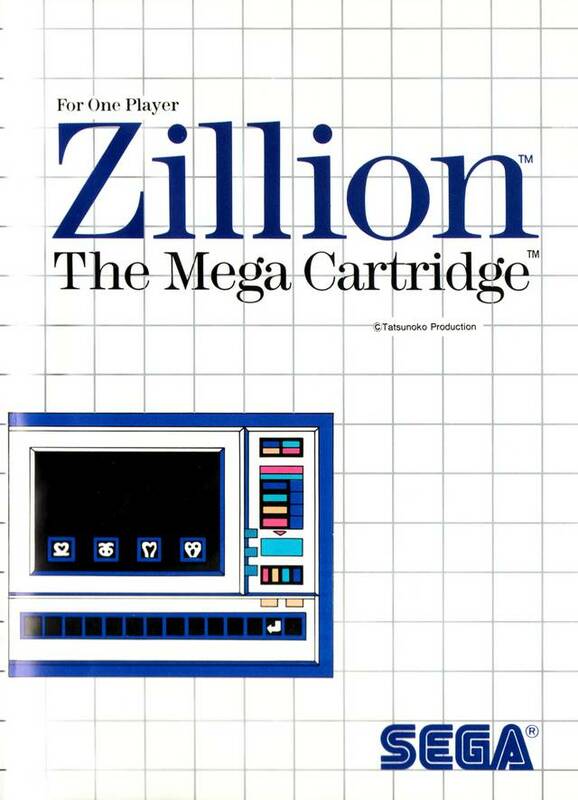 Outside of Master System fans, many gamers out there haven’t heard of Zillion. No surprise, as Sega did a terrible job of marketing both the Master System’s gems and its duds. Zillion‘s case is particularly depressing. Just look at that Western cover: what was Sega thinking? On the off chance that you’ve heard of Zillion but haven’t played it, you’ve probably heard two interesting ideas attributed to the game. 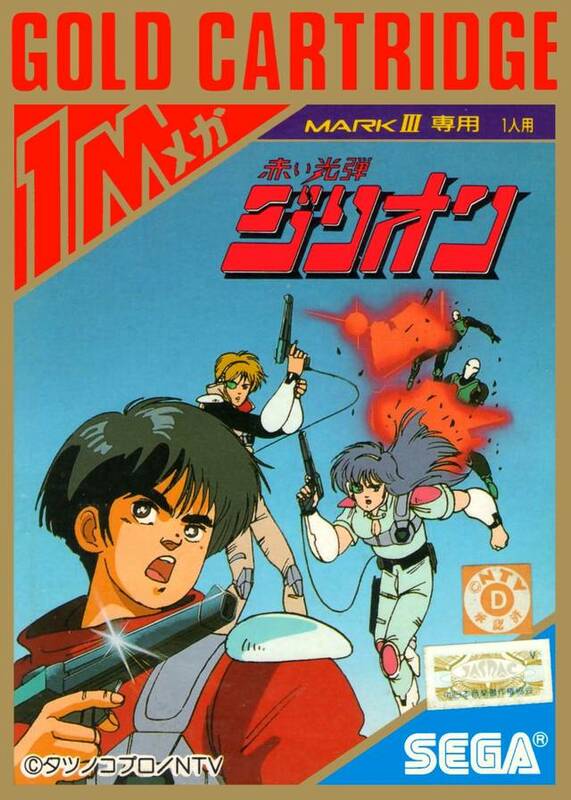 The first would be that Zillion is the Master System’s answer to Nintendo’s own non-linear space adventure, Metroid; the second is that the in-game weapon inspired Sega’s light gun for the Master System, the Light Phaser. The latter is a strange belief given that the Light Phaser debuted in America in late 1986, while Zillion didn’t release until mid-1987. Zillion didn’t inspire the Light Phaser. 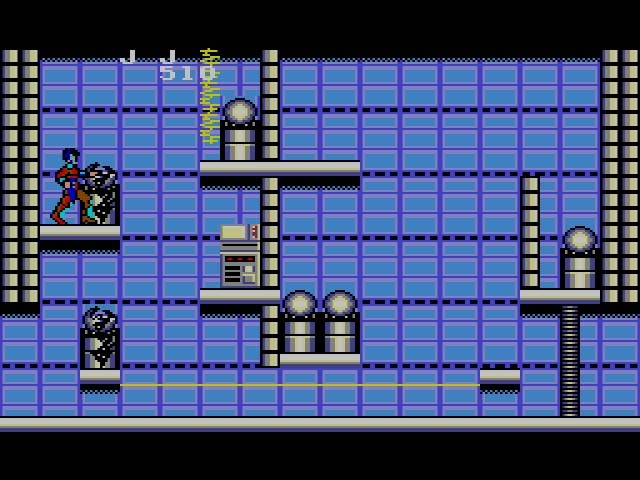 Zillion gave the Light Phaser top billing by having three of the game’s four playable characters use one. The former idea – Zillion being Sega’s yin to Nintendo’s Metroid yang – is more subjective, but to me, the similarities only go so far. Yes, both games are non-linear platformers that take place in space, but in Metroid, you’re exploring a world, not just increasingly difficult areas within a single base. Your missile upgrades, weapon upgrades, and health extensions all feel vital in Metroid because the atmosphere you’re in is moody, tense, and bleak. Zillion feels light-hearted by comparison. The space stations are full of danger, yes, but they’re well-lit and soundtracked by a rollicking Capcom-esque theme. In Zillion, back tracking is often a choice, except in rare circumstances where you’re you’re forced to go one way and leave the other for later. In Metroid, backtracking is vital because you’ll often explore all directions with nowhere else to go. The more of Samus’ abilities and weapon upgrades that you find, the more Metroid unlocks before the player. By contrast, characters in Zillion level up, but the effects are limited to additional health, slightly stronger lasers, and the ability to jump higher. Outside of some pods that can only be destroyed by using leveled-up weapons, the increased abilities in Zillion don’t unlock more of the alien base. Yes, the similarities between the two games are there. Metroid, however, is more exploration-based adventure with action bits, while Zillion is pattern-based action with adventure bits. Did Sega crib inspiration from Nintendo? Sure. Who didn’t in 1987? To my mind, though, Zillion is different enough to feel like its own beast. I’m sorry, gentlemen, the Safety Dance has been cancelled. Zillion doesn’t come near the depth of Metroid or Legend of Zelda – the non-linear games of the mid-80s – but the game was certainly unfamiliar and likely uncomfortable territory for the arcade-leaning Sega. The company had to have known, though, that if they were going to compete with the ever-evolving, ever-popular Nintendo, they’d have delve into different genres (see also: 1987’s Phantasy Star, Sega’s first in-house developed RPG). Sega would still focus heavily on their arcade stable going forward, but awesome aberrations like Zillion began to appear more and more often, standing as examples of Sega learning from their contemporaries while still remaining true to their identity. I probably can’t remember it because I would have taken one look at that box art and swiftly moved on. Woops, I failed to mention the comparison to Impossible Mission in the review. Thanks for the reminder! An early entry in to the multi-platform franchise – anime and game. Its interesting to see this develop back in the mid 80s. We already had “Rocky” which as you said in the podcast was actually a rebranded run of the mill boxing game but would this be the first intentional tie-in to a tv/movie franchise? Probably the first international tie-in to a TV/movie franchise. Sega had Golgo 13 and Sukeban Deka II but those were Japan-only. As always a great review! I was able to purchase this game – 2 years ago – for a mere … 1 euro on a flea market. This is probably gonna sound a bit pathetic: But I often find my gaming experience somewhat enhanced by having the actual game obtained in a rather satisfieing (often cheap) way (wich seriously contradicts my habit of ranting about “market” validation being wrongfully considered to be the highest most truthful essence in life) -. I haven’ played it yet, but your review certainly warmed me up to do so! 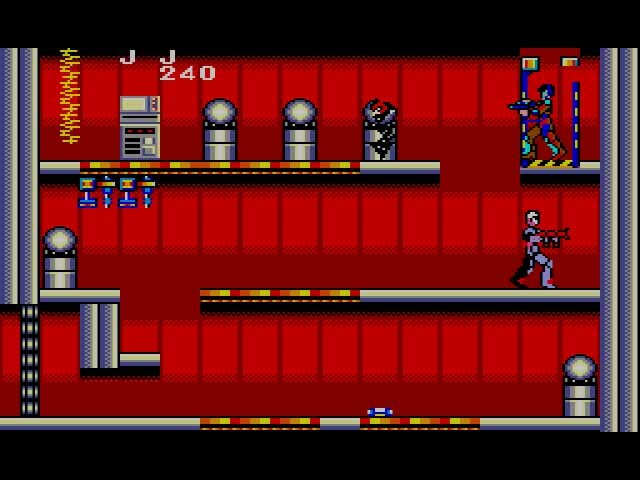 I read on several other retrogaming sites, that Zillion is, at least by some, considered to be somewhat of a Master System Classic. Since you don’t grant it an A-score, I assume you disagree with that qualification? I was wondering from which game the background (Skyscrapers city at night) on your NES blog was taken? I seem to recollect those types of in-game skylines to be quite popular in the day. I remember them – in all their 8- and subsequently 16 bit glory – having a rather mesmerising effect on me as a kid. Back than, I literally obsessed over highrises. I even had several books about them. In the nineties skycrapers were still quite exotic over here. The last 2 decades though, european cities have been starting to catch up on that front. While architecturally still appealing to me, I’m growing a bit weary of their globally uniforming effect. I hope we and other continents wont forget to preserve our own distinctive architectual styles and monuments. Also the financing sources (as caricatural example: Trump Tower) are often morally troubling in my view. As you can probably tell I’m quite interested in cities. I have yet to visit the US (I’m actually planning a trip to New York this september! – Though I’m aware that about a fifth of your comprariots don’t consider that to be the “real” America. I don’t know wether that’s sad or funny). I’ve done quite a lot of amateur research (the www; Google streetview, … very few academic sources I must admit) on stuff like city layout, and I’ve come to the provisional conclusion that cities like NY an Frisco are not examplary but rather exeptional American cities. In the sense that their urban center is dense and more integrated (public transport, …In that way they resemble european cities ) Than that of other Big US cities (LA, Houston, …). Dissapointingly, The second (in terms of population) US-city (LA) apperently has a smaller city-center than that of the biggest Belgian cities. It’s Basically a tiny urban core surrounded by an endless suburban sprawl. Do you live in or near a big metropolis? Does my above theorising somewhat matches your experience or have I got it all wrong? Sorry to stray so far off topic! Hi Pieter! Glad to see you back here! I’ll answer your questions in the order given by you. As far as Zillion goes, while I enjoyed the game, I don’t think I’d call it a classic. It’s one of the best Master System games I’ve played so far, but the gameplay – while enjoyable – is a bit repetitive. So much so that I’m not sure it would hold up to repeated playthroughs. Still a great game, though! Kudos to you for finding it so cheap. As for the NES blog background, I’m not sure that’s taken from a game. I believe an artist made it and put it on the Internet, and if I knew who that person was, I’d give them the proper respect and credit. Alas… Kinda reminds me of the Mega Man 2 background a little, though. Just a little. Congrats on going to New York! I can’t say how that will be, as I’ve never been, but I’ve heard it’s expensive, loud, and crazy. You will probably witness American rudeness on a massive scale. Don’t worry, we’re not all that mean. I live in Austin, Texas, which is a medium-sized city turning into a suburban sprawl. Austin is one of the fastest growing American cities – I’ve read reports that hundreds of people move here every day. The thing I like about Austin, though, over, say, L.A. is the personality and friendliness. I’ve never lived in a friendlier city with more to do. Concerts, art bazaars, hiking, swimming, heck, retro gaming conventions. It’s impossible to be bored here. Traffic’s not LA bad, either, though it is bad. I don’t have experience with New York, but San Francisco is a fantastic city… to visit. It does feel like more of a “city” city too, particularly if you live or work downtown. The scope and scale almost feels otherworldly, compared to more sprawling locations like LA, Phoenix, and Austin. And there are more sprawling cities in America compared to anywhere else in the world. “We have the room for it, so why not?” seems to be the mindset. Richer people need to live further away from everyone else. These are the rules. Thank you very much for taking the time to answer all of my questions. Is it easy to navigate through all these nice places and great events in Austin … I mean for a guy like me who insists on traveling by bycicle or public transport? Or must you own a car, if you want to indulge in the cultural Life? Is the town architecturaly (aestheticaly) pleasing to you? Some edifices or street ensembles that would warrant a trip? Is it easy to stumble upon a flea markets or garage sales with retrogame treasure in your viscinity? So, if over the next couple of weeks I remain silent again … rest assured I will not have abonded this great “web” hang-out! If you live more in South Austin or Downtown, you could get away with riding a bike where you needed to go. The streets are narrow and dangerous, though. If you wanted to explore all Austin has to offer, you’d need a car. Downtown is very architecturally pleasing, but outside of that… it’s very much like any other city. There’s a mixed style that permeates through the city. Some areas feel more like the Southwest, like Arizona or New Mexico, while others feel like Texas proper. There’s a stretch of highway that runs along rows of trees – that area feels like the Pacific Northwest. Also, there are a lot of beautiful parks and long stretches of bike path. I would say, if you’re interested in getting a taste for “hip” America (hipness being subjective, of course), Austin should definitely be a stop, particularly if you like great food and live music. There is a chain of stores in Austin called Game Over Videogames, and they have a surprisingly wide assortment of retro gaming paraphernalia. No doubt there are tons of flea markets here also, but I haven’t explored those yet. You guys should def have a “Worst Master System Box Art” poll when you get to the end. This one gets my vote so far! How the heck did that work??? Crazy, no? Apparently, he’s in the game too, but I never found him.